The world of social media has been a breastfeeding lifeline for me. So often, I have reached out to virtual friends and found solace and sisterhood through tiny screens in the small hours of the morning. Yet I am not naive to the other side of the social media coin. I have witnessed and have been subjected to the online shaming that too many breastfeeding mothers have faced, at the hands of ill-informed and time-rich trolls. 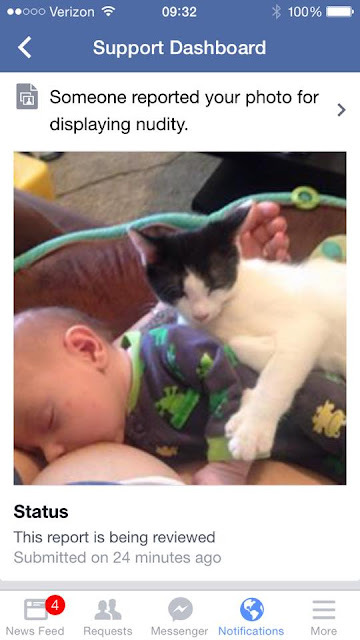 "I love this picture of my baby and my kitten, snuggled on my lap, so I posted it to my Facebook page and someone had the nerve to report it!" In a time when we walk past billboards of breasts without thinking twice, and cleavage is used to sell anything and everything, it amazes me that a picture of a baby breastfeeding could be considered inappropriate. "...we always allow photos of women actively engaged in breastfeeding." "I'm happy to say that my photo wasn't removed and I inspired another friend of mine to share her never-before shared pictures. She had previously felt too uncomfortable to post them. By sharing, we reach more mamas and encourage and inspire them!" This is what social media is all about. Inspiration and encouragement. To reach those moms who are questioning themselves, or running on empty. To reach out a virtual hand and offer solidarity in a world that so often feels so utterly disconnected. If you need proof, just take a peek at Lansinoh's Instagram feed (here). Lansinoh is a household name for most nursing moms, but what many of us don't know at first is the company's efforts behind the scenes to ensure that nursing moms are supported and informed. This is why we are partnering together throughout this project, to reach more moms and in Carrie's words - to "encourage and inspire them". Mamas, there is no shame in breastfeeding. There is no shame in sharing your precious breastfeeding moments and your inspirational breastfeeding stories. If you would like to get involved and pledge your support to the #NoShame project, you can do so by simply posting your favourite nursing photograph to the Mama Bean Facebook page, using the hashtag #NoShame. Because we're in this together, mamas. Thank you to mama Carrie for allowing me to feature her story in this piece. For more glimpses into real life breastfeeding, join the Mama Bean village on Facebook!